To provide our clients with an unbiased & independent report on the condition of their roof covering without the undue influence of profit for maximising repairs. To be objective & practical in offering solutions to any problems revealed. Don't gaze up & wonder about the condition of your roof - get it 'roof-checked' today. We are Specialist Roof Coverings Surveyors as well as property maintenance contractors who can gain access to your roof for that 'close up' inspection & full report. Most Building Surveyors are unable to gain full access to your roof slopes & viewing at a distance through binoculars for their roof survey can only reveal limited detail of the roofs condition so your section on the roof survey is often incomplete or over specified on the work that may be necessary. Your Chartered Building Surveyor will usually write in his roof survey report ' refer to roofing specialist' (who are normally roofing contractors) for further investigation. This is purely because in most cases your Building Surveyor was unable to gain adequate safe access to your roof for the roofing survey report. Home extension guide - practical advice for all homeowners looking to extend their homes for most types of house extension. Once you get in a 'Roofing Contractor' motivated by generating work, this can leave you exposed to various & inconsistent opinions motivated by profit rather than what actually needs doing. In times of economic boom, many roofing contractors just do not have the time or motivation to provide you with free reports especially if your roof only needs minor repairs and they may not get the roof works anyway - especially if you have yet to purchase the property. We are different - we tell it like it is! We are independent roof coverings surveyors who can normally gain access to your entire roof to view & inspect the conditions of valley gutters, hips, ridges & flashings etc. close up. We will provide you with a full roof survey condition report that will give you guidance on the likely repairs, scope of work (if any) & budget costs for a pre-agreed fixed fee. Many of our roof survey reports simply confirm the adequacy of the existing roof covering and that a major roof overhaul is actually NOT required all because the original Building Surveyor was over-precautions in his assessment of the roofing works that 'may' need attention to cover future claims of negligence against him. This happens more often than you think and is often the main reasons why a lot of property sales fall through. Alternatively, if you just have a specific technical problem or roof leak where we can inspect & offer instant on-site verbal advice, without the need for a written roof survey report then we can provide this service as well for a lower fee. We are fairly flexible in our approach & adaptable to providing the kind of roofing survey service you may require for your particular need or application - just ask. Would you go out in the rain with a defective umbrella? - then why ignore the condition of your roof ? So many people do though until its too late & water damage has occurred. Most people when questioned about this attitude actually knew that their roof was in poor order but decided to ignore the fact - out of site out of mind seems to be a common theme. A lot of the roof covering works are often not completed by specialist experts. Many local builders will try to save money & do it themselves rather than employing dedicated tilers and roofing specialists. From 30 feet away the roof probably looks well constructed to the untrained eye but it normally has some in built long term defects if it has not been installed correctly that may be expose shortly after the main contractor has been paid and gone. If you are in doubt as to the quality of your new extension roof then give us a call. 2. Poor choice of materials. Many roofing companies will only purchase the cheapest materials in order to maximise the profits or mistakenly think that this is the only way they can be competitive. Most home owners are unaware that they actually have choices in this area and cheapness doesn't always mean poor quality BUT wouldn't it have been nice to have been informed of your options. A common mistake is to re-roof a slate roof with heavier tiles without providing additional bracing or support to the roof carcass with the inevitable roof sag over the next 10 years. 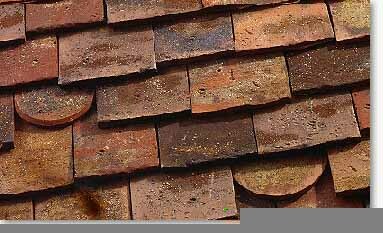 If you have had some roofing work completed & you are unsure as to the choice of materials used then give us a call. 3. Poor weathering & abutment detailing. Another classic of a 'quick fix' repair when it should have been renewed. Lead flashings and valley gutters are common problems for a so called 'repaired roof'. Often the price roofing companies charge for repairs actually warrants the installation of a proper repair rather than a short term bodge but as you can't see it you will just have to take their word for it that it has been properly completed. If you are still having roofing problems to a 'repaired' roof & require a proper and truthful assessment of what is actually required then give us a call. 4. Damage caused by others. Had an aerial or satellite dished installed on the roof recently? Funny how the roof has now started leaking just a few weeks after. Most trades unrelated to roofing such as vermin hunters, and ariel installers do not have the same duty of care when clambering about on another persons roof. Even with the proper roofing 'ridge clip' roof ladders damage to the roof coverings nearly always seems to be the result. Would you like an independent assessment of your roofs damage & who did it - give us a call.